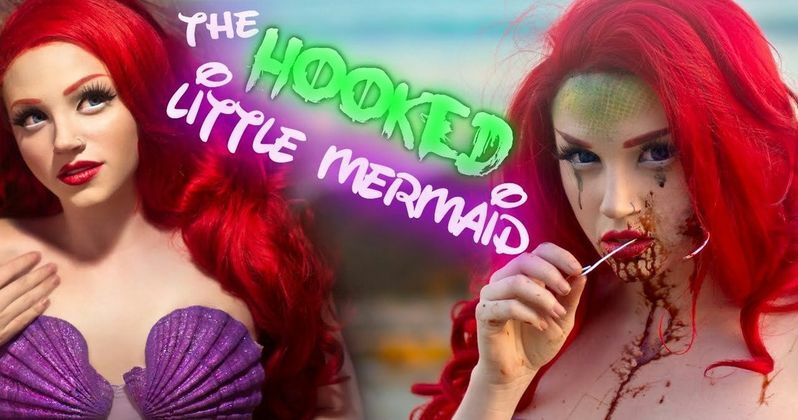 Mykie is a self-taught professional beauty and special effects makeup artist based in Los Angeles that is making insane Disney princess horror makeup tutorials on the Glam and Gore YouTube channel. She currently has over 1 million followers via social media that love to see what kind of horrific tutorial pops up next. Mykie is definitely not a one trick pony when it comes to her makeup talents; the gore is often juxtaposed against beauty at which Mykie is equally skilled. Suddenly the name of her YouTube channel, Glam and Gore makes a lot more sense. For the Disney princess videos, Mykie likes to imagine that something terrifying happened to them as a result of their fairy-tale lives. Her tutorial videos all start with a bit of dramatic music and film work before the unveiling begins. After the initial viewing, a detailed tutorial on how to apply the makeup is shown. For instance, The Hooked Little Mermaid shows what Aerial would have looked like if she were caught by a fisherman. Mykie's description of the video is perfect. It reads this. "Aerial has always wanted to be a part of the land-dwelling club, but we humans ain't as glorious as ya think, girl. If you wanna walk, run, and play all day in the sun you're gunna have to survive an oil spill, turn part scaly fish, and get caught with a hook to the cheek before you finally get washed up on shore. Congrats! Enjoy humanity!" In another tutorial video, entitled Shattered Cinderella, Cinderella has managed to get a glass slipper lodged into her eye. The description for the video reads: "It's not easy being single...Especially when your rental dress could turn back into rags if you miss your curfew. But don't worry! The good guys are still out there! Their names just might not be Prince Charming. Is it opposite day? What a disaster that was. I'll be subtweeting about that bad date for months to come... just takes a little longer to type with one good eye." In addition to the amazing makeup skills, the videos are like short stories that are really well done and very entertaining. Most of the videos have over millions of views and thousands of comments that are either in love with what they see or appalled. Mykie recently explained her motives behind starting the Disney series. She says this. "This is my interpretation of the dark side of Disney. Putting a spin on Disney is nothing new, in fact it's been done in art and cosplay for quite a long time, and many of the stories themselves come from Brothers Grimm fairytales. But I wanted to put my own twist on that, and bring it to YouTube with SFX makeup." Other Disney Princesses that Mykie has taken on include Burnt Belle, Frostbite Elsa, Strangled Rapunzel, Sick Snow White, and No Sleeping Beauty. In addition to her Disney Princess series, Mykie also showcases what pop star Lana Del Rey would look like after a zombie apocalypse, how to do Rita Repulsive from The Power Rangers makeup, Industrial Steampunk FX, an Abominable Snowman/Yeti, and way too many to list here. Her videos have collected nearly 200 million views since she started in March of 2014. Mykie's talents are truly something one needs to see to believe. The production value of the videos is excellent and it's also worth noting that she applies the incredibly detailed makeup by herself. Stop reading and check out the Disney Princess Series below and try not to have any nightmares after viewing. The videos are definitely not suitable for young children, so you might want to wait to watch until the kids have gone to bed.